One week from the day his wife died of the same disease, George A. Fox, a foreman for the Faultless Starch Company, died yesterday morning at his home, 1417 Belleview avenue, of pneumonia. He was 59 years old. A week ago Sunday Mrs. Eugenia Fox died after a short illness and her husband displayed symptoms of the same disease at the time. She was buried, and at once Mr. Fox's illness became serious. Six children survive. They are George A. Rhode, Hill, Henry H. and Eugenia Fox, and Mrs. J. W. Lane. Mr. Fox lived in Kansas City twenty-five years in the employ of the Faultless Starch Company. Funeral arrangements have not been made. IN LIP OF CHARLES W. YOUNG. Two deaths within a few weeks, as a result of injuries inflicted by dogs suffering form rabies, has aroused public apprehension in Kansas City, Kas., to such an extent that extra precautions are being taken by the police department to protect the citizens against danger from this source. Orders have been issued by Chief of Police W. W. Cook to kill all stray dogs found in the city and a special officer has been detailed on this work. The general public has been notified to communicate with the police department with reference to any dog running at large. Charles W. Young, a carpenter living at 436 Everett avenue, was bitten three weeks ago yesterday by a small fox terrier and is now in a critical condition at the Grandview sanitarium, where the attending physician said last night he could not live through the day. Violent convulsions, incident to the last stages of hydrophobia, have convinced the physicians that his condition is the result of the injury inflicted by the fox terrier. A desire to relieve the suffering of a poorly fed tramp dog prompted him to reach down and pick up a little fox terrier, which promptly repaid this act of kindness by snapping his teeth through the lower lip of his would be benefactor. The injury was dressed by a physician and Mr. Young continued with his daily work at the Union Pacific railroad shop. On Tuesday of this week he was obliged to quit work because of what he believed to be a severe cold in his throat. Yesterday morning Dr. Albert Huber was summoned and pronounced it a case of hydrophobia. The man rapidly grew worse and last night was removed to the sanitarium. A small child was bitten several weeks ago by a mad dog in the northern part of Kansas City, Kas., and later died with what the physicians said was hydrophobia. Miss Stella Swope, another member of the Swope family, has contracted typhoid fever. Sarah Swope, her sister, was taken ill with the malady a few days ago. None of the invalids are in a dangerous condition. Miss Dixon, formerly governess, who came to the home with Margaret Swope, is seriously ill, but in no immediate danger. Miss Lucy Swope is expected home today from New York, having left Paris upon hearing of the illness of the family, and the death of her brother, Chrisman Swope. Corrigan Ill Less Than One Week. After an illness of less than a week, little Marie Louise Corrigan, daughter of Mr. and Mrs. Bernard Corrigan, died yesterday morning of diphtheria. The funeral will be this afternoon at 2:30, and burial in the family plot at Mount St. Mary's cemetery. The baby was 18 months old. Carrying the unconscious form of her 2-year-old son, Morris, in her arms, Mrs. Lillian McGregor of Kackley, Kas., collapsed at the Union depot last night. The little fellow became ill on the train several hours before it arrived at the Union depot. As his fever grew, the child became hysterical and then lost consciousness. Drs. Harry Morton and E. D. Twyman were called to attend the child, which rapidly developed spasms. Mrs. McGregor was on her way to Fort Madison, Ia., where she expects to visit relatives. HIS MOTHER TO A HOSPITAL. Ernest Wolf, 10 years old, weak from typhoid fever and just out of a hospital, started out last evening to walk from his home in the rear of Holmes and Twelfth streets, from which place his mother is to be taken to a hospital today to his father's at Clinton, Mo. The little fellow expected to follow the railroad tracks. When he got to the Union depot he saw so many tracks that he became frightened and began asking questions. According to Ernest's story which Mrs. Everingham verified through the authorities, his mother, Alice, has been so ill that she has not been able to work for almost a month and arrangements were made yesterday to take her to a hospital. Mrs. Everingham arranged last evening with the Associated Charities to take care of the boy until his mother is able to support him again. Colonel Thomas Swope, who has been confined to his room at the home of Mrs. L. O. Swope, South Pleasant street, Independence, was not so well yesterday morning, but last evening he was improved somewhat. Colonel Swope is suffering from an attack of nervous prostration. There is hope for his early recovery. Mr. and Mrs. Walton Holmes, Jr., have returned from their European trip, which was terminated at London owing to the serious illness of Mrs. Holmes. Mrs. Holmes is well on the way to recovery. "It had been planned to tour Europe, but the sickness of Mrs. Holmes terminated everything and our only anxiety was to get back home," said Mr. Holmes yesterday. Dr. J. F. Binney was called from Kansas City to attend Mrs. Holmes. While on the way over on the Cunarder Mauretania, Dr. Binney was called, with a Dr. McArthur of Chicago and the ship's surgeon, to perform an operation for appendicitis upon a boy on the ship. The patient has recovered. Mrs. W. H. Holmes, Sr., who was a member of the party, has not yet returned from Europe. mates Near When End Comes. "If I have to die and go to heaven, I want to be at home, where all my playmates are," said 10-year-old Royal Schick of Albuquerque, N. M., who, in charge of his mother, Mrs. Robert Schick, passed through the Union depot yesterday on their way home from a visit in Dubuque, Ia., where the boy had been advised to go in the hope that it would benefit his health. Royal is suffering from a severe case of kidney trouble which has baffled the physicians of the New Mexico city. The case developed over a year ago, up to which time his mother says he was apparently in as good health as any of the boys of his town. Since then he has gradually wasted away. A moth ago the physicians at Albuquerque recommended a change in climate. The Northern trip was suggested, as it would be cool, and then it was hoped that the lower altitude might prove beneficial. The little fellow grew worse and finally begged his mother to take him back home. Mrs. Schick missed the early train for the Southwest and had to remain at the depot all day. The little fellow was made comfortable in the hospital ward in the depot until night. HEARD HIS CHILD WAS DYING. Although it was much cooler yesterday than the day before, one case of heat prostration was reported in Kansas City, Kas. John McWilliams, a teamster employed by the Armourdale Lumber Company, while driving his team along South Tenth street yesterday afternoon, was notified that his 4-year-old son was very sick and likely to die. McWilliams tied his team and ran all the way to his home at 376 South Boeke street, a distance of nine blocks. When he reached his home he fell in the doorway unconscious. He was attended by Dr. J. A. Davis, who had been called to attend the child. Dr. Davis said he was prostrated by the heat, and that the condition was critical. The child, which was stricken with spasms, recovered before his father reached home. Still in an unconscious state, Governor Thomas T. Crittenden is slowly sinking. At times, since he was stricken with apoplexy Thursday afternoon at Association park during the baseball game, he has seemed to be nearly conscious, so much so as to nod his head and move his hand, but yesterday afternoon and evening brought a decided change for the worse. His unconsciousness is seeming to grow deeper and he now gives no sign of life other than his breathing and unusually good heart action. It is this heart action which is keeping Governor Crittenden alive, according to his physicians, who, with trained nurses, are constantly in attendance. "I consider Governor Crittenden's condition extremely critical," said Dr. Ned O. Lewis, one of the attending physicians, last night. "However, we expect that he will survive the night, though his recovery seems now to be impossible. It is his strong heart action that is keeping life within him now." All of yesterday scores of Governor Crittenden's friends visited the home at 3220 Flora avenue, although no one was allowed into the sickroom. Messages of sympathy and hope for recovery have been received by the family from many sources. As the result of a stroke of apoplexy which came upon him yesterday afternoon while watching a baseball game at Association park, former Governor Thomas T. Crittenden is lying at the point of death at his home, 3220 Flora avenue, with physicians in constant attendance. Slight hope is entertained for Mr. Crittenden's recovery. His age and general ill health are said to be factors against his rallying. Though Mr. Crittenden had not regained consciousness up to a late hour last night, it was ascertained by the attending physicians, Ned O. Lewis and J. C. Rogers, that Mr. Crittenden's entire left side is completely paralyzed. The left side of his face is badly bruised where he struck the benches in front of him when he fell forward at the ball park. Mr. Crittenden had been sitting in the grandstand near the third base line during the first of the two games which were played between Kansas City and St. Paul. Other spectators who were sitting near him said that he had not displayed any unusual excitement over the game and had been sitting rather quietly. It was the beginning of the second inning of the second game when Mr. Crittenden was seen suddenly to fall forward and outward into the aisle. Thinking that Mr. Crittenden had but fainted, his immediate neighbors rushed to pick him up and placed him on the bench, where they attempted to revive him. Dr. Stanley Newhouse, the park physician, was hastily called from the press box, where he had been watching the game. He gave Mr. Crittenden prompt attention, but was unable to revive him. Mayor Thomas T. Crittenden, Jr., was summoned from the city hall. He was driven to the park in an automobile, and suggested that he drive his father home in the motor car. Dr. Newhouse advised an ambulance, and one from the Walnut street police station was summoned. Then Mr. Crittenden was taken to his home. After a long consultation with Dr. Lewis and an examination of Mr. Crittenden, Dr. Rogers stated that while the patient was in a precarious condition and that he was critically ill, there was a little hope for his recovery. "It all depends upon the size of the hemorrhage on the brain," said Dr. Rogers. "It appears that the hemorrhage is from a ruptured small blood vessel, but we do not know whether or not the flow had been stopped completely. Governor Crittenden has been in poor health for several months. That taken into consideration with the fact that this is the second attack, does not argue well for a speedy recovery." Dr. Newhouse, who first attended Mr. Crittenden, is not so sanguine as Dr. Rogers. Dr. Lewis remained with his patient all night, and did not make a statement. Eighteen years ago, while Mr. Crittenden was a practicing lawyer, he had his first stroke of apoplexy. No ill effects resulted from the first stroke, other than to make him more susceptible to the second. Mr. Crittenden has long been a baseball enthusiast and there have been few games this season, according to his son, that he has missed. It has been his chief recreation, and though his family feared for him to go alone to the games on account of his age and declining health, Mr. Crittenden persisted in doing so. Mayor Crittenden said last night that his family had feared some untoward incident as a probable result of his innocent recreation. Dr. Newhouse stated last night that he believed the attack was caused from an overwrought nervous condition. He said that it occurred at a lull in the game and excitement, and was the result of a reaction upon the nerves, even though Mr. Crittenden had not appeared excited. Mr. Crittenden in 77 years of age. He was born January 1, 1832, in Shelby county, Ky. His father was Henry Crittenden, a farmer, and the former governor was one of eight children. He received his education at Center college, Danville, Ky. Among his classmates were Judge John F. Philips of this city, who was by his bedside last night; W. P. C. Breckenridge, John Young Brown, and other noted men. Mr. Crittenden studied law at Frankfort. Soon after his marriage to Miss Carrie W. Jackson he moved to Lexington, Mo., where he first practiced law. There he remained until the civil war when he and Judge Philips raised a regiment of federal sondiers, and were engaged in the war for three years. Many of his battles were fought in Jackson county. At the close of the war Mr. Crittenden formed a partnership with Francis M. Cockrell, afterward United States senator. During that time Mr. Crittenden was sent to congress from Missouri. In 1878 Mr. Crittenden became governor of Missouri, and the four years of his administration were stormy ones. At the close of his term he moved to Kansas city, where, with the exception of four years, he has resided since. That exception is during the time he acted as consul general to Mexico under President Cleveland. Mr. Crittenden has three sons, H. H., Mayor Thomas T., both of Kansas City, and William J. Crittenden of Pittsburg, Pa., now in Japan. Came in Less Than a Week. After an illness of less than a week with double pneumonia, C. B. Hayes, speaker of the lower house of the city council, peacefully met death this morning at 1 o'clock in St. Joseph's hospital. Relatives were at the bedside. Last Thursday morning Mr. Hayes sat on the board of equalization at its meeting. At noon he was taken ill and went home. By night he was confined to his bed and the next morning taken to St. Joseph's, where his condition as found to be critical and remained so up to the time of his death. The pneumonia was complicated by an affect of the heart. Yesterday afternoon he began to sink rapidly and members of his family were sent for. They remained with him all night until the end came. Last Sunday morning at the Church of the Annunciation Rev. Father William J. Dalton asked for the prayers of his congregation for the speedy recovery or happy death of the stricken councilman. EXALTED RULER OF LOCAL ELKS. Mr. Hayes was born in Chicago July 20, 1865, and had been a resident of Kansas City since September 1, 1896. At the last municipal election he was elected alderman of the Eighth ward on the Democratic ticket, and was later chosen speaker of the lower house of the council as a compliment from his associates in that branch of the council. Two weeks ago he was chosen exalted ruler of the local lodge of Elks. He was a member of the Manufacturers and Merchants' Association, the Currant Club, Turners, Knife and Fork Club, Third regiment, and secretary of the Missouri River Wholesale Grocers' Association. Prior to coming to Kansas City, Mr. Hayes had held important positions with the Bliss Syrup Refining Company of Chicago, and as an appreciation of his services the company made him manager of its Kansas City branch. HAD NO TIME TO MARRY. He held this position for five years, resigning to organize the C. B. Hayes Merchandise Brokerage Company, a commercial concern with headquarters in the West Bottoms. Mr. Hayes always took a lively interest in the upbuilding of Kansas City. He was active in negotiations for the building of the Union passenger station and freight terminals. He was unmarried, saying that he could "never find time to marry." Mr. Hayes was a member of the council committee considering the building of the Twelfth street west trafficway, and the foundation for his fatal illness was contracted in Chicago when eh went with the committee to inquire into the Chicago plan as applied to the street railway companies. He caught a severe cold on that trip. With four of the best twirlers on the Blues' staff in the hospital, the prospects for starting the season with well trained flingers assumed a very gloomy aspect yesterday. Two of them must stay in bed at least a week, under the most favorable conditions, and may be confined for six weeks. One is out, but may be ordered to a bunk on short notice, and the other will be laid up for at least ten days. The sick list contains William Duggleby, "Nick" Carter, "Vinegar Bill" Essick and "Lefty" Brennan. Roy Brashear has a severe cold which may put the star infielder out of commission later, but he is still able to play. Duggleby has a badly swollen eye as the result of being hit on the head by a pitched ball Sunday and will not be able to play for at least ten days, although he will try to keep in training to a certain extent during that time. Essick is able to work, but he has a severe cold which will not keep him away from practice altogether unless it gets worse. The real sick members are Brenan and Carter. They played Saturday and Brennan was able to make three hits in the game Sunday, but yesterday the club physician stated that they had malaria fever and made them go to bed for at least a week. They may be able to get up at the end of that time if their condition shows improvement daily, ubt should they get worse, which is altogether probable, they may be confined to their rooms or a hospital for six weeks.. Manager Cross knows what Essick and Carter can do. In fact, they are about sure of being on the regular staff this season, but Brenan is entirely new to Cross and it is a question whether Duggleby can pitch the brand of ball needed in this league. He failed to do anything remarkable in the Eastern league a year ago and unless he shows improvement this spring he may not draw a regular station. "Rear Admiral Robley D. Evans will arrive on the Burlington from St. Louis Saturday morning at 7:10. Meet him with a wheel chair and see that he is cared for. He has a severe attack of rheumatism." This was the order received by Union depot officials last night. "Fighting Bob" is coming to Kansas City to lecture next Tuesday evening at Convention hall under the auspices of the local Young Women's Christian Association on "From Hampton Roads to San Francisco," relating interesting incidents in connection with the cruise of the American battleships during the first leg of their globe-encircling journey. It was not known here that Admiral Evans was ill until the above instructions were received by the depot authorities. Kansas City business men had planned to have a delegation meet the distinguished visitor and entertain him, but it is probable that his condition will prevent him from taking part in any social functions. It is thought, however, that he will be able to fill his engagement. Blanche Walsh, one of the most prominent of feminine stars on the American stage, is ill at the University hospital and her engagements for the next two weeks, which includes her St. Louis date, have been cancelled. Miss Walsh, according to the hospital physicians, is suffering from an enlarged liver, and while she intended to come to Kansas City and simply rest for a week, her physician advised her to go to a hospital and remain there for treatment. The hospital authorities say that Miss Walsh's condition shows no dangerous symptoms, and while an operation may be necessary, it is not probable that surgery will be resorted to. Miss Walsh came to Kansas City from Joplin on a special train yesterday morning. She first went to the Baltimore hotel, intending to stay there, but the physician advised her to go to the hospital, where her recovery would be more rapid and more certain. "Miss Walsh's tour is booked up until the middle of June. With the exception of these two weeks the remaining dates of her tour will be filled. She will resume her work in Kansas City, opening at the Willis Wood for a week's engagement February 28. "Miss Walsh has been under a severe strain all season, and while her ailment is one of long standing, she has never before taken it seriously. It was only yesterday, when we were within hailing distance of Kansas City, that she decided to cancel two weeks' time, come here and consult a physician and take the rest which she thought she needed. "She was greatly disturbed over the erroneous report that she intended to end her tour in this city. Such a thing was never contemplated." 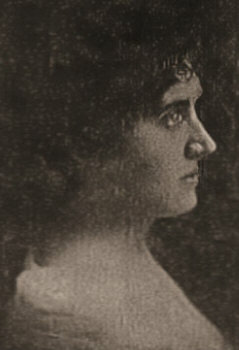 Miss Walsh has appeared in many roles in Kansas City theaters. Her earlier successes here, of course, were in such famous plays as "Cleopatra," "Gismonda," "Fedora," "Tosea" and other great plays, in the star parts which she succeeded Fanny Davenport. Something which would startle the medical world and bring a wave of relief over humanity if it proves to be true. Two men in Kansas City, Jeff Burgess and William Nutberg, employes of the Heim Brewing company, believe they have discovered this boon to the human race. A lowly, humble and obstinate mule was the means of this discovery, if discovery it be, and again that much abused animal has proven its usefulness to ungrateful man. Recently one of the mules used by the brewing company stepped on a rusty nail, and last Thursday this mule showed signs of the dreaded tetanus. Burgess, who is stable foreman, conceived the idea of giving the mule an electric shock to relax the muscles. Neither had anything to do with the conclusion which resulted in a treatment that relaxed the tightened muscles of the mule's jaw and perfected what is thought to be a cure at least in animal tetanus. When the shock was applied, that of 110 volts of current, the mule was contorted. A few moments after the men who were working for the animal's life were startled, as well as gratified, to see the mule open his jaws. The beast is now able to eat without difficulty, and if he becomes entirely well, the matter will be taken up by physicians and experiments carried out which will demonstrate either the futility or the success of the treatment thus discovered by two men who have neither the learning of science or surgery. Who knows? It may be that the men, the mule and the current may add one more important discovery to the long list of the twentieth century. tained at Home by Illness. At the last moment there were some unexpected changes in the personnel of the city officials who accompanied Thomas T. Crittenden, Jr., last night to omaha, to attend the sessions there of the League of American Municipalities. R. L. Gregory, president of the upper house, who has been ill for several days, did not feel physically able to undertake the task, and Alderman J. F. Eaton was advised by his physician not to go. HOWARD HAS A HIGH FEVER. Melford W. Howard, former congressman from the Eighth Alabama congressional district and a member of the Higsen party, was taken ill at the Hotel Baltimore yesterday afternoon. It is probable that he will be unable to fill a St. Joseph speaking engagement Monday night. Dr. J. R. Snell, house physician at the hotel, was called into consultation at 5 o'clock. Dr. Snell said that Mr. Howard had a very high fever which might not be reduced in less than twenty-four hours. Starvation in Kansas City, Kas. Robert Neudeck, a well known resident of Kansas City, Kas., is slowly dying of starvation at his home, 1052 Reynolds avenue. The attending physicians have abandoned hope for his recovery and announce that the end is only a question of a short time. More than a year ago Mr Neudeck suffered an affliction of the stomach. At first it was not thought to be serious and his doctor placed him on a light diet. The case has baffled the physicians. From all indications the walls of his stomach have grown together. Mr. Neudeck is a member of one of the oldest and best known families in Wyandotte county. He has been engaged in the mercantile business, and for a number of years was a member of the local police department. NEW GRIEF FOR MRS. HEADLEY. Just as Mrs. Ward Headley had finished reading of the attack upon 5-year-old Eunice Swift, with which her husband is charged, in the morning papers yesterday, her sister entered her room and told her to hurry to the bedside of their mother, Mrs. Melinda Greenstreet, who, it was thought, was dying. The bride of a week, already dumbfounded by the sudden knowledge of the crime for which her husband is under arrest, sat as one dead to the world, as if she had not heard the sad news which her sister had brought. It took much urging and explaining by the sister before Mrs. Headley collected her wits enough to understand just what was happening. Hastily she arose from her chair and without a word walked bareheaded to her mother's home, 1706 Indiana avenue. There she found her aged mother at the point of death. Mrs. Greenstreet had not been informed of the charges against Mrs. Headley's husband, and without a word, Mrs. Headley took her place beside the bed. Later in the day when a visitor questioned her concerning her husband and his alleged crime, Mrs. Headley could scarcely speak, so great was the strain under which she labored. "I do not know what to think of it," she said. "Ward was a particular friend of the Kelso and Swift families, and to learn that he had attacked those little children was a complete surprise to me. "The only explanation I can offer is that he was crazy drunk. For three days steadily he has been under the influence of liquor. Friday night some of our friends came over to our house and gave us a chariavari. He was drunk when he went to bed that night and his actions were peculiar. Saturday morning when he got up he had not quite sobered, but he insisted on going to a saloon for another drink. Against my wishes he went, and he stayed two hours. When he returned he brought two bottles of beer with him. "That afternoon he decided to go to the Kelso's, 'just for a few minutes,' he said. I understand that he had more beer there, but I have seen nothing of him since he left our home at noon. "Am I going down to the jail to see him?" she repeated in reply to a question. "Well, I should say not. I am through with him for good. My mother is almost dead, and I wouldn't leave her for anybody. I don't think I will try to get him free, or to get him out on bond. I can't help believing the charges are true for the evidence is unmistakable." Mrs. Kelso and Mrs. Swift, the mothers of the two girls, went to the Greenstreet home yesterday to see Mrs. Headley and to express their sympathy for the unfortunate young wife. "I feel very sorry for Mrs. Headley," said Mrs. Swift. "She is such a fine little woman, much better than Headley deserved. This and her mother's condition are a severe blow to her Mrs. Kelso and I will do all we can to help her through her trouble, but we will not let up on the prosecution of her husband." Eunice Swift, the little girl who was most seriously injured, is said to be greatly improved, but is still under a physician's care. Ethel Kelso is still suffering from nervousness and extreme fright. "I am innocent of the crime they charge me with. I have known the little Kelso girl ever since she was born, and liked her very much. "This arrest reminds me of the time I was arrested on the charge of stealing a watch, not many years ago. At that time they thought they had enough evidence to put me behind the bars, but I fooled them and proved that I was innocent. That's what I am going to do this time, too." Headley requested that his wife be notified of his arrest, and that she come down to the jail to see him. He wanted to talk to her, and explain that thing were not as bad as they had been painted. He felt confident that he would be successful in making his wife believe that it was a put up game against him." Martin Curry, father of the much advertised Curry triplets, was arrested yesterday afternoon on a warrant issued out of the juvenile court, Kansas City, Kas., charging him with neglecting his children. He was locked up in the county jail and will be arraigned in the juvenile court today The arrest of Curry was caused by numerous complaints made by neighbors. He has six children beside the one remaining triplet, Boaz, the two others having recently died. It is the older children that he is accused of neglecting. He stated last night that he had in no way neglected his family as far as he knows. He proposes to hire an attorney and fight the case. Under the juvenile court law neglect of children by their parents is punishable by a fine and jail sentence. On Sunday afternoon December 22 last, triplets were born to Mr. and Mrs. Martin Curry, 2543 Alden avenue, Kansas City, Kas. The babies, two boys and a girl, were all perfectly formed and unusually healthy. Curry is a laborer and, owning to his poor financial circumstances, the people of the two Kansas Citys became deeply interested in his family, especially the triplets, and hundreds of dollars were contributed by the public that the little ones and their mother should not need for anything in the way of care and attention. The speedy and generous response of the public lifted a load of worry from the father and all went well until the death of Mrs. Curry, which occurred five weeks after the birth of the triplets. The little ones were doing splendidly at that time and the prospects for them to live were pronounced good by the family physician. At the time of Mrs. Curry's death an effort was made to have the triplets placed in a nursery where they might receive the best of care, but the father decided to trust the rearing of the babies to his 17-year-old daughter Bertha. Ten days ago the babies were taken ill from having been fed sour milk. Ruth died on Wednesday, June 17, followed by the death of David last Sunday. Boaz, the last of the triplets, still lives, but is not in the best of health. Dr. T. C. Benson stated last night that the child was much better than it was a few days ago, and expressed the belief that it would live if properly cared for. It was Dr. Benson that named the triplets, christening them as they were born. BE IN THE BIG ROOM. "Wait till our new playroom's done." That is what the little boys and girls, inmates of the Mercy Hospital, Fifth street and Highland avenue, are saying. Everything now centers about that large new playroom which is almost completed, and every morning and afternoon the nurses have to take the children back into the new building and let them feast their eyes on the room which is to mean so much fun to them. Some of the little patients in the hospital have been there for seven months, and in some cases there are not many signs of improvement. Their lives are not full of pleasure, and it is seldom that visitors who take more than a patronizing interest in them are seen. The little fellows feel that they are being made spectacles of and they can see the pity in their visitors' eyes. That is not what they want; they want comradeship. Their games are few, and in bad weather they must stay indoors. For this reason they look forward to the large playroom with such promise of rainy day pleasure. At present there are eleven patients in the hospital, ranging from 10 days to 8 years in age. The older children are unusually bright and quick to learn, and in the most instances they desire to keep up their school work while in the hospital. Slates and school books have been provided for that purpose and the nurses take turns in teaching them. Few of the children, except the infants, are confined in beds, and so they find ample time to play at their games. Running games are on the "blacklist" among them for one of their number is a cripple and cannot move without the aid of crutches. The children themselves have passed the rule that no game which calls for running or jumping shall be played, and so most of the time is spent in telling stories and piecing card maps. "You see Joey, he's got hip d'sease, and it ain't fair to him if we play tag cause he'd have to sit and look," said one little girl in telling about their games. But the nurses take the most interest in the infants. Maybe it is because every unnamed infant which is brought to the hospital is named for one of the nurses. There are Anne, Ruth, Carmen and Marjorie. Then the male infants are named for the doctors or particular friends of the nurses, such as Ralph and Billy. Billy is the pet of the hospital. He belongs to a mother and father who wish he did not belong to them, and consequently they are never seen about the hospital. Billy is 2 years old and is almost blind, totally in one eye. He can not talk, but his actions are so pathetic, say the nurses, that "you just can't help loving him." And so Billy gets the cream. Miss Virginia Porter, superintendent of the hospital, says that older children are all well behaved and that they grow fond of the hospital and nurses. Even though they come of parents who do not love them, for the most part, Miss Porter tries to teach them that they should love their home and their parents above all else. The children all show the effect of this teaching, for when one little girl in the hospital was asked if she would rather stay in the hospital or go home, her little face grew long and she said: "I'd rather go home, I guess, for Mrs. Porter says that homes are the best places in the world."